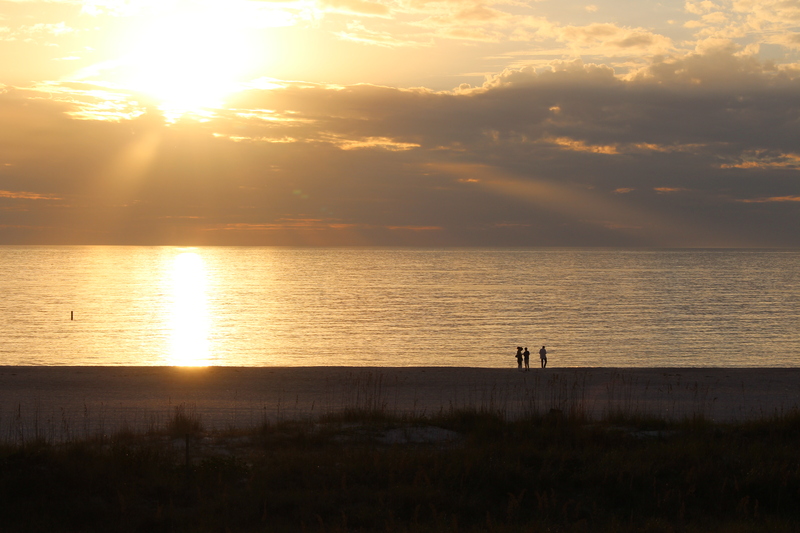 Five things to do in a day: St. Petersburg, Florida | Oh, the Places We See . . .
Of course, we all want ample time to explore a city lined with mature, moss-filled trees. A city where world-class art museums, shops sporting local crafts, and hotels with beckoning porches await us. A city like St. Petersburg, Florida. But that’s not always the case. With only one day to explore and hit the high spots, you can be hard pressed to see it all and do it all. But you CAN see a lot . . . if you have a plan. 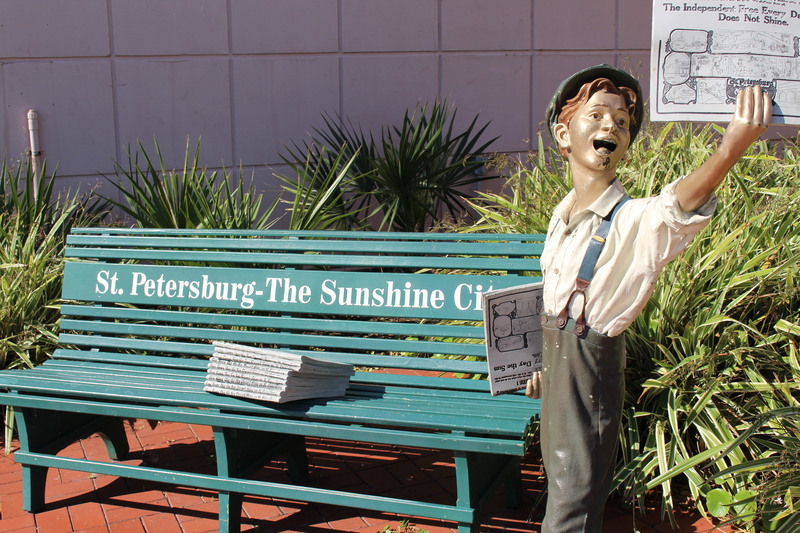 Here are our top five “must-see’s” and “must-do’s” for a day in St. Pete. 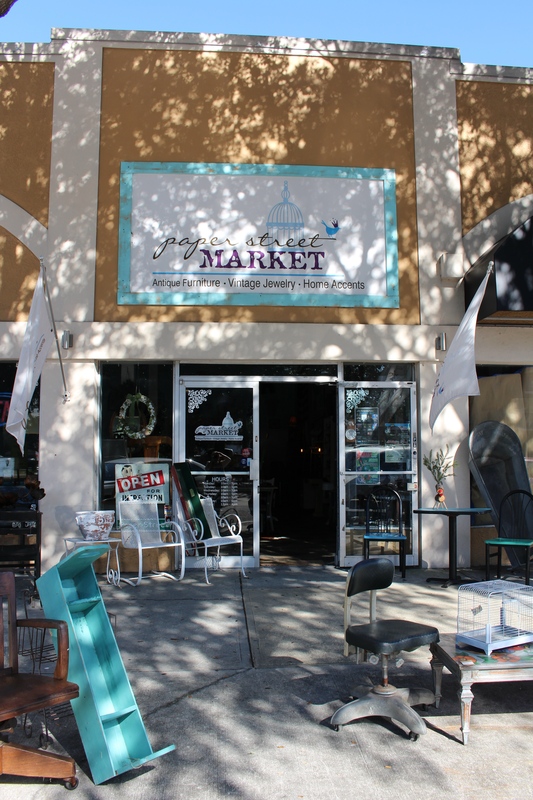 After breakfast, but still early, head to Central Avenue to do a little junkin’. Stop in at Paper Street Market (915 Central) for industrial finds like sewing machines, architectural drawings, and metal signs. Or pick up a re-purposed desk and chair for your office. Want to do it yourself? Iron Pelican (2452 Central) just may have the lowboy of your dreams. But sometimes you’re looking for a first edition of To Kill a Mockingbird. And if you are, you might get lucky at Haslam’s Book Store (2025 Central), Florida’s largest for new and used books — or that’s what the website says! Come on in. There’s more inside at Paper Street Market on Central Avenue, St. Pete. Whatever you do, don’t miss Florida Craftsmen (501 Central) where emerging and seasoned artists display their finest work — like fiber art shoulder bags, hand-thrown pots, baskets woven of mixed grasses, and creative jewelry from fine, fine metals. 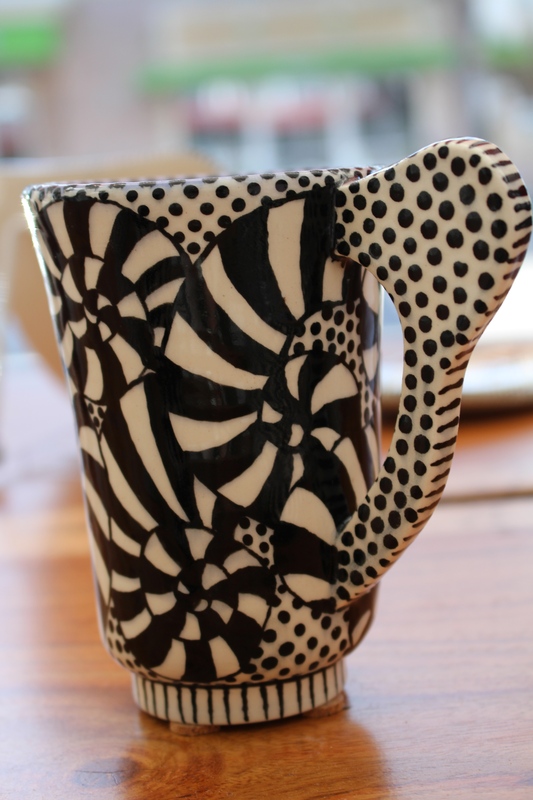 Adorned with a bold graphic, this mug catches your attention in the window of Florida Craftsmen. Hungry yet? 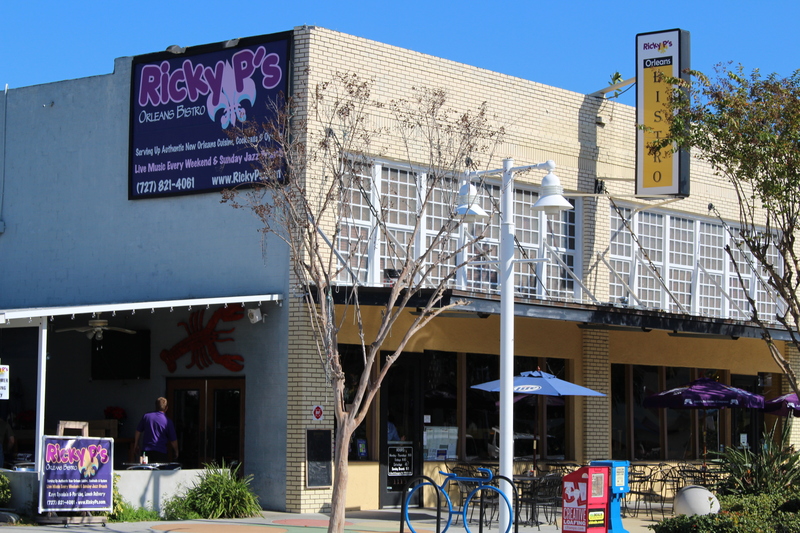 Duck into Ricky P’s (1113 Central) for the Ultimate Shrimp Po-Boy or the Best BLFnT (Bacon, Lettuce, Fish — that’s Fried Tilapia — and Tomato) with remoulade sauce for an extra kick. Too much sandwich? Then dig in to Creole Jambalaya (crushed tomatoes, andouille sausage, chicken, and rice, of course). Even if you’ve seen the original Dali Museum, you’ve gotta go back to see this newly designed, architectural gem. Emerging from this rectangular building designed by Yann Weymouth, the “eclipse” — a 75-foot tall curved window of 1062 triangular panes — offers a glimpse into the signature art collection of Salvador Dali. (For more pictures, click here.) Take the helical staircase (Dali was obsessed with spirals) to the third floor where docents stand ready to share tidbits of the artist’s life and inspiration. They’ll even shine flashlights on those hard-to-find illusions and symbols you might miss on your own! Want a cup of tea after touring? There’s not a prettier spot than the gardens facing Tampa Bay. Adorned with Dali touches (spiral design, drippy watch bench, and a labyrinth made of hedge), the fanciful gardens just might have you looking for the Mad Hatter from Alice in Wonderland — or Dali himself! 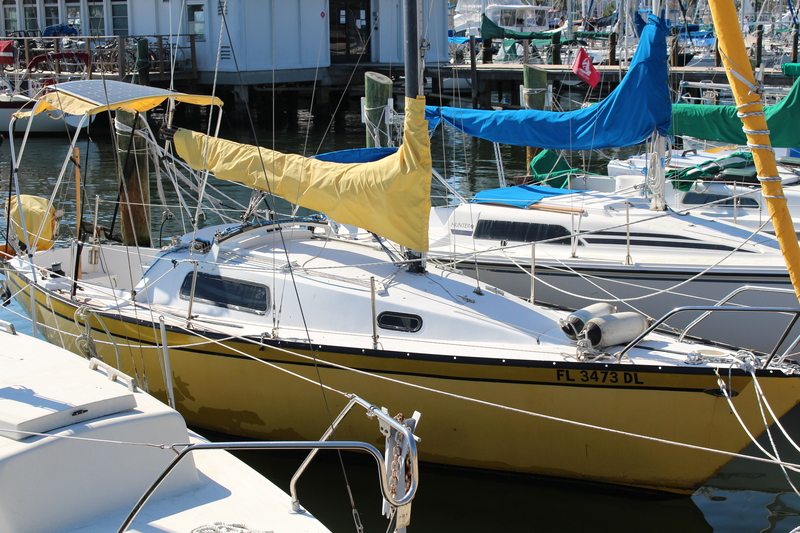 A stroll along the bay might be in order after viewing all that symbolic art, so drive out to The Pier and admire the boats just waiting for a good wind and a savvy sailor. Park your car and stroll the parks while admiring the outdoor sculptures . . .
or the magnificent banyon trees standing like puddled drapery in an aristocrat’s home. 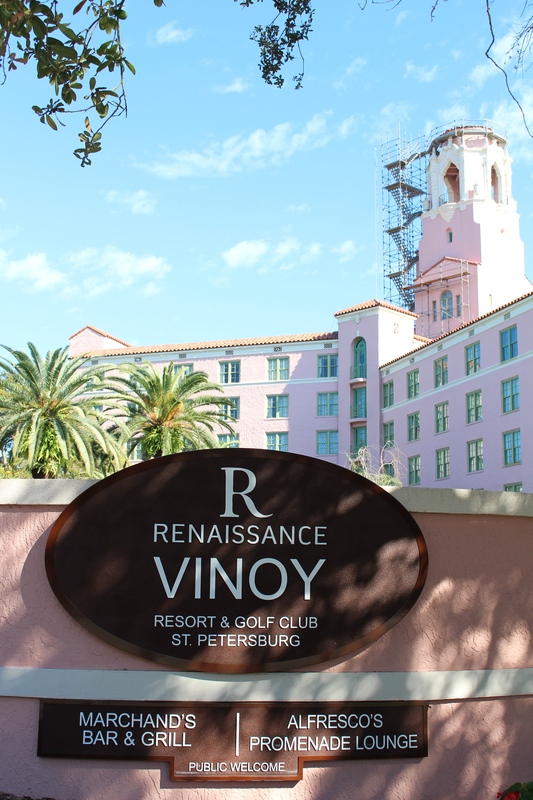 After staring at art, strolling the park, and wishing you owned one of those lovely boats in the bay, head over to the Vinoy Renaissance St. Petersburg Resort and Golf Club (501 5th Ave., NE) to take a load off. Order a drink, find a rocking chair on the porch, and watch the people go by! You may even be lucky to be there when a big event comes to town. Like the Beef O’Brady’s Bowl. 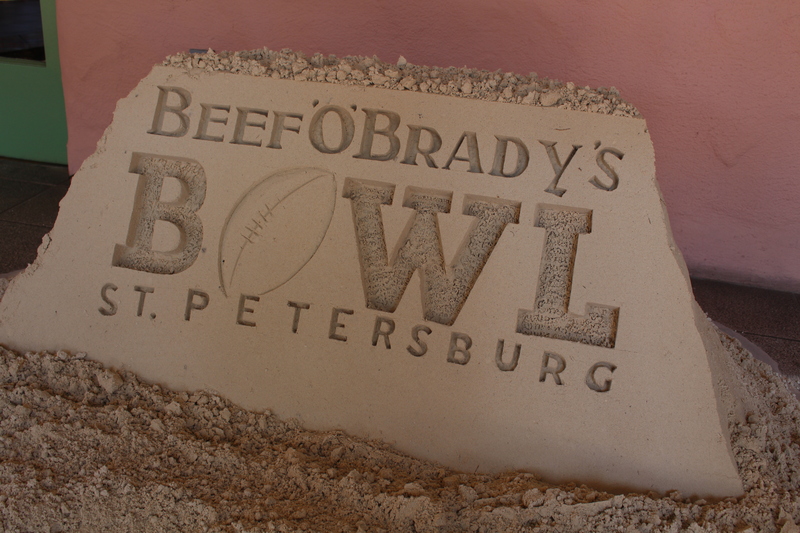 And then you’ll see a sand sculpture greeting the fans and maybe even the team passing by on their way to the buses. Or maybe you’ll just see folks like us hanging out, capturing the breeze, and watching the sun go down. With one last push (OK, you can do it! 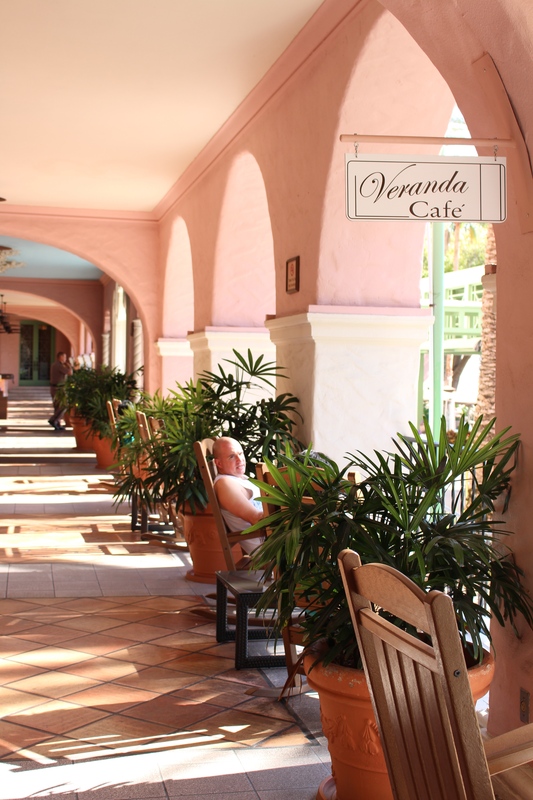 ), you’ll leave The Vinoy and move down Beach Drive where you can take in the Chihuly Collection (400 Beach Drive NE) and the sweet little shops and restaurants along the way. 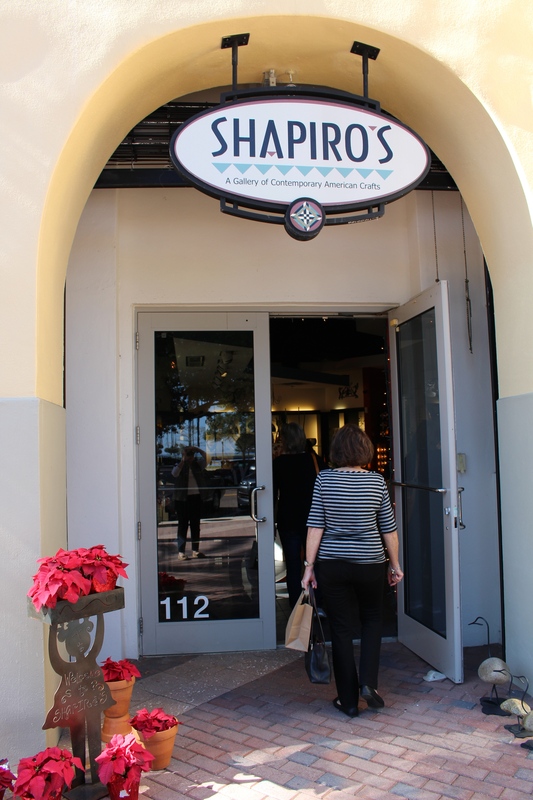 With a vast selection of contemporary crafts, you’ll surely find a souvenir or a special, one-of-a-kind item in Shapiro’s (300 Beach Drive). 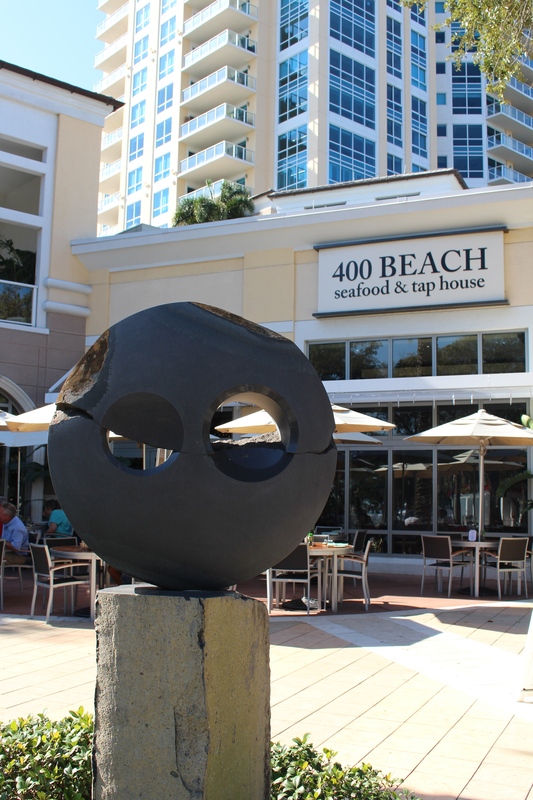 At the end of the day, treat yourself to one of the specialties at 400 Beach Seafood & Tap House. Like Lobster Mac & Cheese, Tandoori Spiced Mahi Mahi, or Florida Grouper Oscar. Be sure to ask if you can eat outside. On the sidewalk! Not up for that? 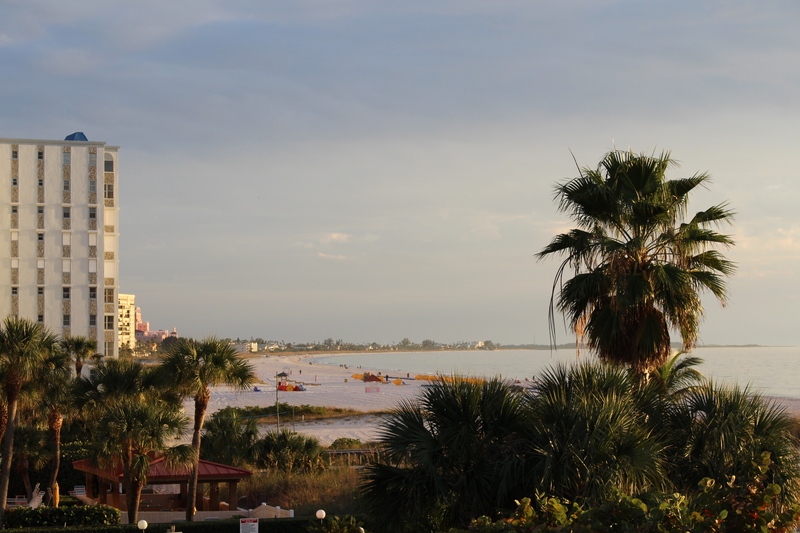 Well, you can always tool it on down to St. Pete Beach where sunsets are free and Happy Hours are plentiful! 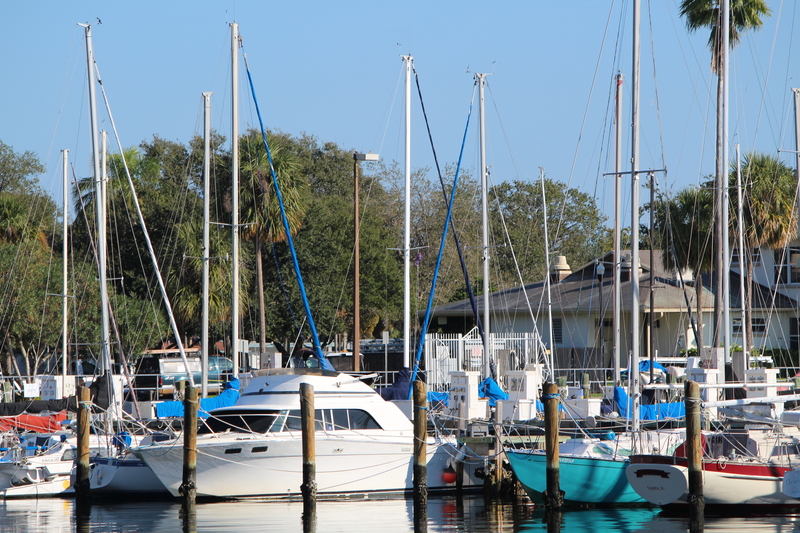 Whatever you choose to do, it’ll be a great day in St. Petersburg! This entry was posted in Destination, Florida, Hotels, Museum, Restaurant, Retail Shops, Travel and tagged 400 Beach, banyon trees, Florida, Iron Pelican, Paper Street Market, Ricky P's, Salvador Dali, Shapiro's, St. Pete Beach, St. Petersburg, The Vinoy. Bookmark the permalink. Pingback: From teapots to turned wood, don’t miss Florida Craftsmen in St. Pete! | Oh, the Places We See . . .
You�re quite welcome. 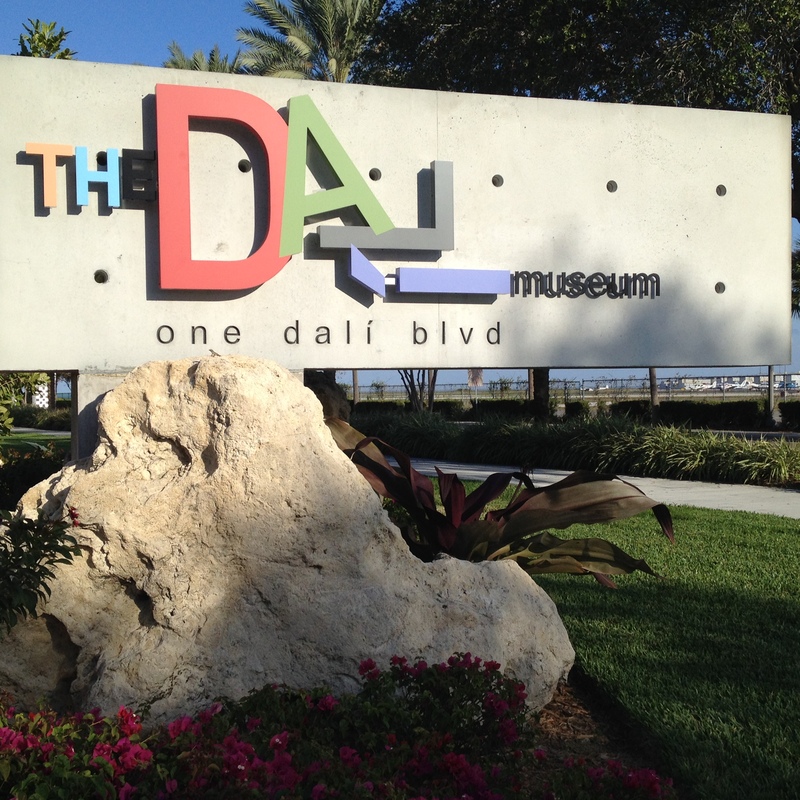 If you haven�t seen the new Dali Museum, you must. The Chihuly Collection, although small compared to Dali�s volume of work, is lovely. Thanks for reading & commenting! I have visited Dali Museum, it’s just gorgeous. Very nice pictures you posted Rusha. Thanks for the comment. 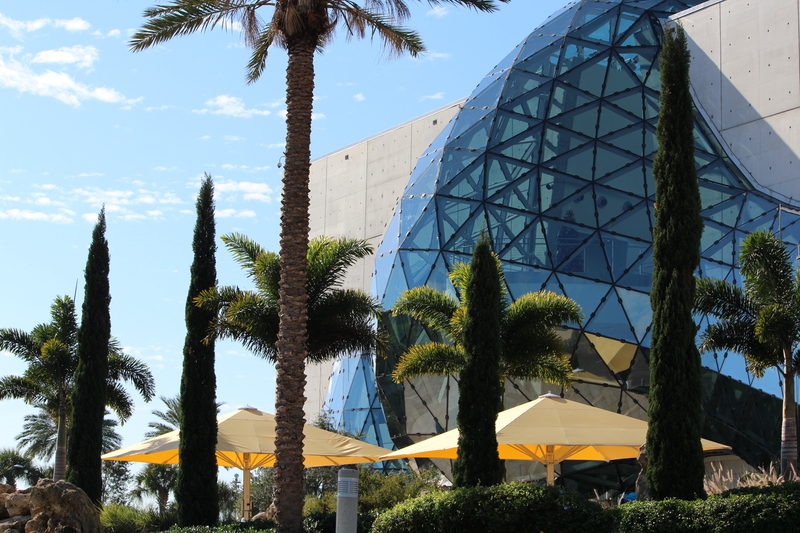 The Dali Museum is a must-see for anyone — quite the collection! And those docents — so much information that I would never have known had we not been with one! You are very right on that. The docents are very knowledgeable. I only live a couple of hours from here and YES, it is one fine fun city to visit. You live in a fabulous part of the country! Nice weather, beautiful scenery, great art, and SEAFOOD! Thanks for reading, commenting!